Utsunomiya University Faculty of International Studies and Center for the Multicultural Public Sphere (CMPS), Support Infants, Children, and Pregnant Women of Fukushima (FSP) and Project in Response to Needs of Infants, Children, and Pregnant Women of Fukushima (FnnnP) have supported pregnant women, infants, children and their mothers who wish to evacuate or have already evacuated from Fukushima. 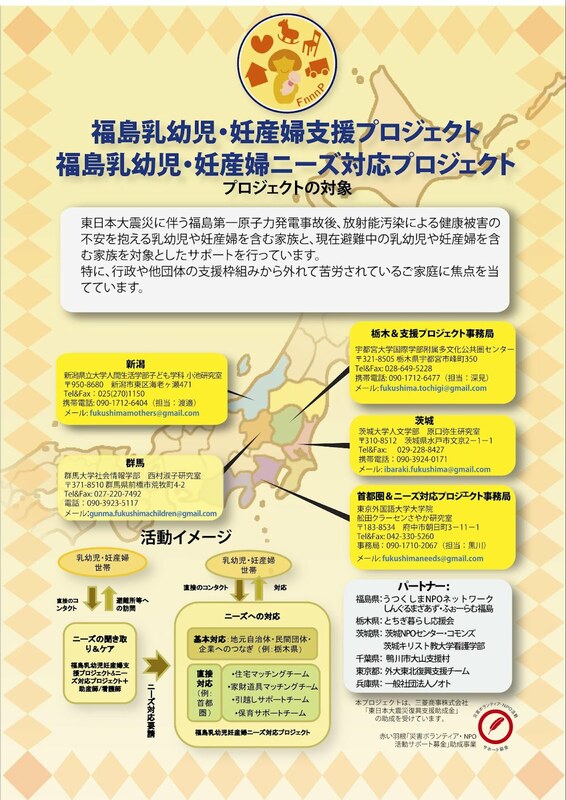 From August 2011, the organizations in collaboration with Utsukushima NPO Network (UNN) have conducted questionnaires investigating possibilities of relocation as a result of the nuclear accident and other effects on families with preschool aged children in Fukushima as one of its projects. The following is a summary of the contents and results of the organization’s questionnaire research. Questionnaire investigating how families with preschool children in Fukushima view possibilities of “evacuation” as a result of the nuclear accident. In order to consider means of support including “relocation” as well as understanding the situations and inclinations of families who have preschool children in Fukushima after the nuclear accident. FSP, UNN and FnnnP designed the questionnaire, and UNN with cooperation from Fukushima Child-support Network distributed and collected this questionnaire from 238 families with preschool children in Fukushima from August 2011 to December 2011. FSP in collaboration with FnnnP inserted and consolidated the results, and UNN and FnnnP provided support based on their needs. The respondents are biased toward anxious families since the main aim of this questionnaire interview was to provide support to families in need. 218 out of 238 parents remain anxious about raising their children in an environment of radiation contamination. 49 parents want to evacuate to a place where there is a lower level of radiation. 76 parents consider evacuating, however, they have difficulty considering their circumstances. 112 parents would like to get more information about radiation protection and radiation doses. In this research, we found out reasons why they cannot evacuate despite their hopes for evacuation, the reasons why they do not consider evacuating, and necessary support. Em resposta das dificuldades das mães e crianças em Fukushima, o projeto tem por finalidade oferecer informação sobre serviços de apoio para aqueles que moran perto das zonas afetadas. Caso você mora nestas áreas e necessita de informação em relação ao apoio para mães e crianças, por favor entre em contato com membros do projeto ao seguinte endereço eletronico. En respuesta a las dificultades que enfrentan las madres y niños en Fukushima, el proyecto tiene por finalidad ofrecer información sobre servicios de apoyo para aquellos que viven cerca de las zonas afectadas. Si usted vive en esas áreas y desea información relacionada con el apoyo para madres y niños, por favor contáctese con los miembros del proyecto a la siguiente dirección de correo electrónico. 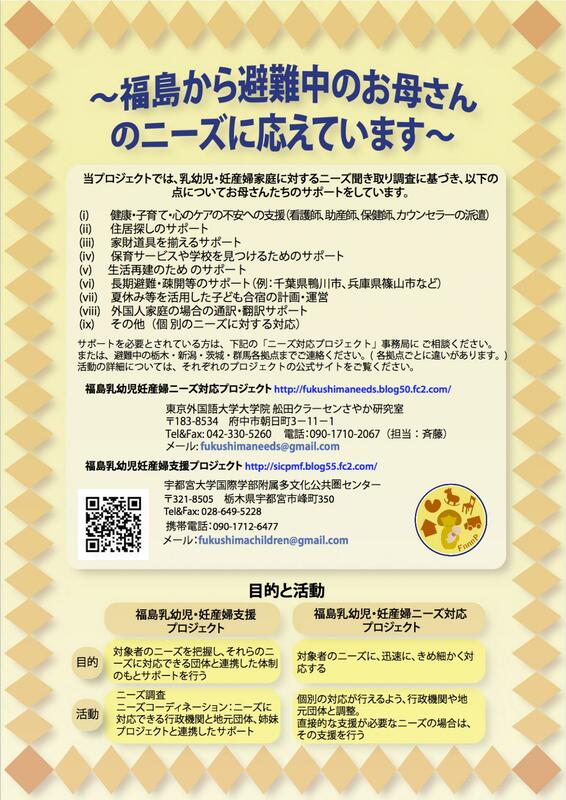 In response to the difficulties faced by mothers and children in Fukushima, the project aims to offer information on support services for those living in the afflicted areas. If you live in the affected areas and would like information regarding support for mothers and children, please contact project members at the following email address.